A ferret is a small, warm-blooded mammal in the weasel family (mustelidae). Ferrets are long in body with short legs. There are two kinds of ferrets—the domestic ferret and the black-footed ferret. 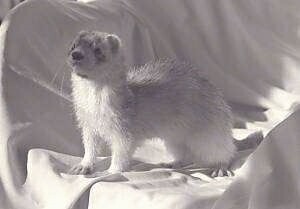 The domestic ferret is the type widely kept as a pet. Domestic ferrets vary in color from white to nearly black usually with a dark mask and tail. Black-footed ferrets have dull yellow fur that is slightly darker on the back. Black-footed ferrets have black feet, black tail tips, and black fur around the eyes. The scientific name for the domestic ferret is Mustela putorius furo and black-footed ferret is M. nigripes. Ferrets are amusing to watch and quite playful and mischievous. Intelligent predictable with mellow temperaments, they will oftentimes take things they see laying around the house and hide them. While roaming around your house they will climb into any tight spot they can fit themselves into. They will probe every possible nook and cranny so ferret-proofing a room or the whole house is a challenge. They do not make a whole lot of noise. Ferrets enjoy any attention their humans can give them. Take them out of their cage and let them explore your home and they will often get silly and start bouncing around like Pooh's friend Tigger! Ferrets like to play and should be provided with toys such as plastic tubes, cardboard boxes and balls connected to string. 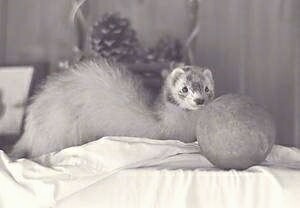 Small toys and thin rope-like objects should be kept out of reach because young ferrets may try and eat them. Ferrets tend to be highly animated for short periods of play activity and then will lapse into a deep sleep. Once asleep they are hard to wake up. Similar to a cat, ferrets rarely ever bite as long as they were handled by humans from a young age and they enjoy being petted. On nice sunny days the ferret’s cage can be places outside for the ferret to enjoy some sun and fresh air. Two or three ferrets do well living together. They can either be kept in a large cage or allowed to roam free around the house like cats. Some owners keep their ferrets in a cage most of the time, giving them daily supervised outings to roam free around the house. Ferrets are born with scent glands that are used as the animal’s natural self-defense mechanism. These glands can have a strong odor and are usually removed from ferrets kept as pets. They will still have a somewhat musky odor from other skin glands. Ferrets are nearsighted but they make up for their sight with their good sense of hearing and smell. Males are larger than females. 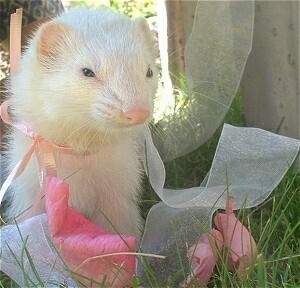 Male ferrets weigh approximately two-thirds more than females. Ferrets are often kept in wire mesh 3-level cages that are about 42" x 31" x 55" providing a sleeping area, an eating area and a waste area. Clean linen should be provided for sleeping. Ferrets like to snuggle up inside the linen to sleep, so be sure the linen is large enough to allow the ferret to get under it (for example, an old large clean shirt or a small blanket). Ferrets also enjoy lounging on a hammock. You can make a hammock by tying a piece of an old sheet to the sides of the cage for the ferret to climb into. They need to be provided with a litter pan to do their business. A litter pan with a high corner back is recommended to keep the waste inside the pan. Ferrets will most certainly enjoy any tubes or tunnels you can add to their cage, however be careful when adding the tubes to make sure they are securely attached because ferrets are great escape artists! Ferrets can be trained to use litter boxes. Ferrets are fairly clean animals and do not require a lot of grooming. They can be brushed occasionally. If they get dirty you can give them a bath. Another alternative to bathing is sprinkling a powder such as talcum, cornflower, or chalk powder on the coat and brushing it off. Nails must be kept trimmed. The ears should be checked for any signs of parasite; a ferret can get the same kinds of ear parasites as cats and dogs. Teeth should be checked on a regular basis for signs of sore gums or clumps of food that can be wiped away. Getting your ferret used to you looking at his teeth will make it easier for you to give your ferret a pill if you ever need to do so. You can also brush your ferret’s teeth with toothpaste made for dogs. Like cats, ferrets are strict carnivores. Although they will accept a somewhat varied diet in captivity, they should be fed primarily meat. They do not digest carbohydrates or roughage well. Ferrets can be fed ferret food from a pet supply store or a good quality cat food. Ferret food is more expensive then cat food but does provide exactly what the ferret needs in its diet. However, a good quality cat food can also be fed and is almost the same thing as ferret food. Dry and canned can both be fed. You can give your ferret leftover fully cooked meats from time to time as a tasty treat. Fish that is not oily can also be fed from time to time. 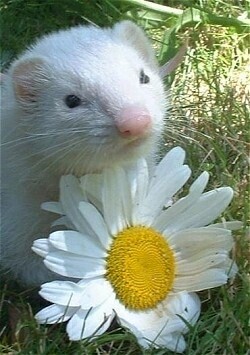 Ferrets tend to eat less in hot weather. Ferrets have a high metabolism and like to eat several times a day. Water should always be provided in a gravity driven hanging water bottle such as the bottles used for rabbits. A ferret cannot be let outside to roam free. They cannot be trained like a dog and will most likely not come back because they are not territorial. They are excellent escape artists, and will wander off and become lost. They can however be fitted into a small harness and will most enjoy going for a walk on a leash. Ferrets are subject to getting the same diseases as a dog can contract, therefore it is important to get a ferret its necessary shots. They are also prone to adrenal gland disease, lymphoma and pancreatic tumors. 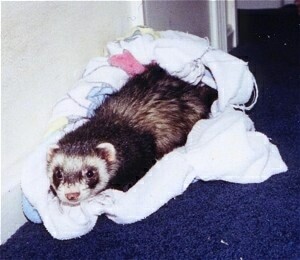 Young ferrets often eat foreign objects and become obstructed. Ferrets are able to breed when they are only 5 to 6 months old. In the United States, almost all pet ferrets are neutered. This is generally done while the pets are very young (4-6 weeks of age). 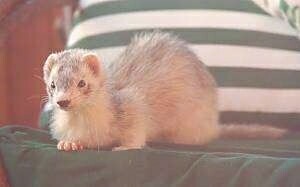 The domestic ferret is a descendant of the European polecat, which was once found throughout Europe. The black-footed ferret is native to western North America and is a wild animal that is on the endangered species list. 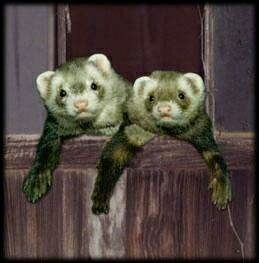 Male ferrets are called “hobs” while female ferrets are called “jills” and baby ferrets are called kits.